This mid-sagittally sectioned model is an original anatomic cast of a real human brain. The components of the model are the frontal and parietal lobe, temporal and occipital lobe, and encephalic trunk and cerebellum. It's a great tool for education on the human nervous system and anatomy of the brain. 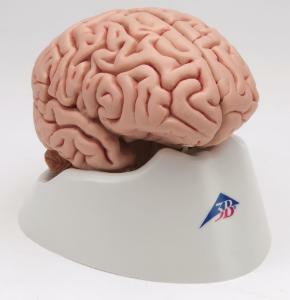 The brain arrives on a removable base for display in the classroom.